The USM Foundation exists to be a catalyst for transformation at the University of Southern Maine. As an independent, nonprofit organization, we work side by side with the University to support the aspirations of our students and the strategic vision of USM. Through the generosity of our donors, we are able to give more students the opportunity to excel in their studies, graduate and build fulfilling lives as they contribute their talents to Maine's workforce. The USM Foundation is an independent, nonprofit 501 (c)(3) organization governed by a Board of Directors, which has full responsibility for the Foundation’s strategic direction and advancement efforts. 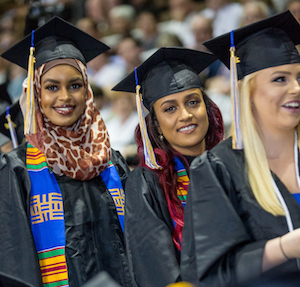 Now entering our third decade of service, the USM Foundation is pursuing new and innovative ways to strengthen scholarship programs, raise capital and achieve ambitious goals, as we help to fuel transformation at the University of Southern Maine.